KUALA LUMPUR, Aug 11 ? Deputy Minister of Higher Education Datuk Saifuddin Abdullah today said he supports repealing the controversial Section 114A of the Evidence Act 1950, widely seen as an attempt to curb Internet freedom, despite the clause only being four months old. The amendment to the Evidence Act, which was passed in Parliament on April 18 after it was first tabled on April 10, is now in force after it was gazetted on July 31. “I am all for repealing Section 114A,” Saifuddin told reporters today, saying that there should be an alternative to the legal clause. Earlier, the Umno supreme council member had spoken at a public forum on whether Section 114A signals the end of internet freedom. “As a Barisan Nasional guy who supports democratic reforms and… a mature democracy, I take this as a hiccup,” he said. The other forum panellists were lawyers Faisal Moideen, Foong Cheng Leong and K. Shanmuga. Critics have pointed out that Section 114A is too broad and contains several weaknesses, such as assuming that an administrator of a website, or an owner of a computer, is the publisher of the content unless it can be proven otherwise. They have also pointed out that the clause is important in cases involving defamation or the Sedition Act — which the government has promised to repeal. Although Faisal acknowledged that part of the clause was too broad when it was drafted, he said that Section 114A does not create an offence or impose a presumption of guilt. Shanmuga pointed out the practical results of the clause, saying that the alleged publisher would have to spend money on lawyers and suffer reputation loss due to the presumption. “To say we can go to court and disprove the burden doesn’t reflect the reality that will be faced by an ordinary man on the street,” he said. He also said that the Parliament had passed the proposed law within a few hours although “this was not an urgent Bill”. Foong claimed that Section 114A “is like a tool to beat Internet users up,” saying this doesn’t match with the BN administration’s move to appeal to the Internet crowd such as the use of social network site Twitter. The forum was jointly organised by the Bar Council’s National Young Lawyers Committee (NYLC), Malaysian Centre for Constitutionalism and Human Rights (MCCHR) and the Centre for Independent Journalism (CIJ). CIJ has slammed the clause for presuming guilt instead of innocence and for making service providers liable for hosting content published by others. The Internet Blackout Day campaign launched by CIJ will take place on this August 14. I was briefly quoted by The Sun regarding Malaysia’s Internet Blackout Day. PETALING JAYA (Aug 8, 2012): August 14 has been declared as Internet Blackout Day by the Centre for Independent Journalism (CIJ). In a statement, CIJ said it is a bid against a recently passed law, whereby internet users are presumed guilty for content posted through their sites, registered networks or data processing devices. On that day, internet users who visit participating websites will be met with a pop-up window detailing information on the campaign, but will still be able to access the website, CIJ executive officer Masjaliza Hamzah said. “Images from the CIJ website and Facebook page can also be downloaded while users can also change their profile pictures to black for the day. 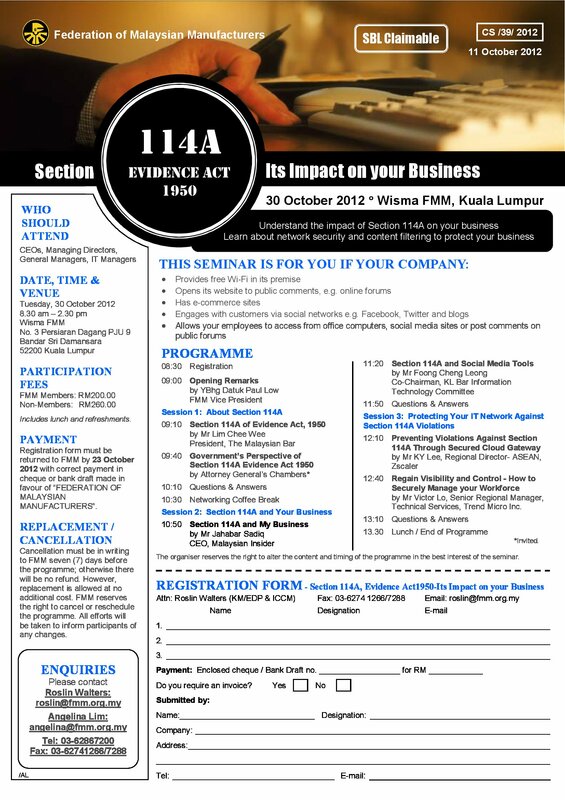 “The day aims to create awareness among Malaysians on the recently passed Evidence (Amendment) (No. 2) Act 2012, which will have a negative impact on freedom of expression online,” she said. She urged netizens to call on the government to withdraw the amendment which saw the insertion of Section 114a of the Act that states an internet user is deemed the publisher of any online content unless proven otherwise. KL Bar Information Technology Committee co-chairman Foong Cheng Leong told theSun it is timely to highlight the effects of the law as the awareness level is still low. “This is an opportunity for internet users to make a stand on this law,” he said, adding that it was not too late. Suara Rakyat Malaysia (Suaram) executive director Nalini E said Suaram supported the awareness campaign to pressure the government to remove Section 114a. “The section is unnecessary and can be misused against anyone, and it also goes against the fundamental principle that one is innocent until proven guilty,” she said when contacted.